Donald Fish is a graphic designer, illustrator, writer and cartoonist whose career spans 60 years. He worked primarily in Australia and England. These examples of his work are from 1957/58. It seems like I should have known about him before now. 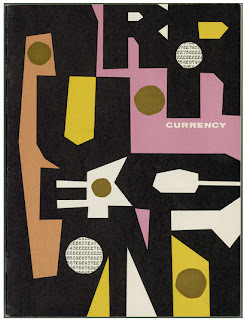 His cover design for in-house bank publication, Currency, looks like something I would have done. I love the playful type, the meandering legibility. Very unexpected for a bank. The wavy, overlapping lines in the single-sheet poster for AWA Radiola are also the kind of thing I find myself doing (and have done in various design comps through the years.) As the design industry continues to shine the spotlight on past American designers, i.e. Saul Bass, Paul Rand, Alexander Girard, it's refreshing to see how the rest of the world's designers interpreted and made use of these mid-century design cues. Thanks to his daughter Charlotte and Design Hub for bringing this talented man's work to the internet so that we may all enjoy.